Invasion ecology has much advanced since its inception. Nevertheless, explanation, prediction, and management of biological invasions remain difficult. Management of alien species is often hindered by crypticity in biological invasions. 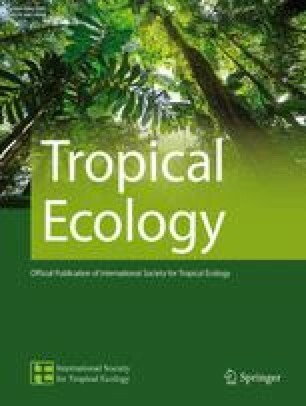 The present study attempts to address the crypticity in ecological functions using insights from selected plant species, namely Lantana camara L. (sensu lato), an established invader and Ricinus communis L., a naturalized species in India. The study species have a broad habitat suitability range and continue to expand in India. We hypothetically placed the study species on the unified framework for biological invasions to assess the performance strategies (manifestations of changing or novel ecological functions) which facilitate a species to breach/overcome the environmental barrier (light availability) and expand in time and space. Results affirmed hypothetical placement of the two species on the unified framework. In view of the results, Lantana camara is expanding its range in shaded habitats and Ricinus communis, as of now, exhibits boom and bust cycles, but may pose a significant invasion risk in the near future through breach of an environmental barrier. The study enabled us to understand how plant performance-related traits and species’ trait modulation potential assist the species in breaching/overcoming barriers to colonize, invade and/or expand. The study generates an impetus for trait-based studies focusing on understudied cryptic functional changes of species. This paper is the crux of the thesis work of NG. NG thanks University Grants Commission, India for Senior Research Fellowship. GPS acknowledges funding support from the University of Delhi, India and Science and Engineering Research Board, Department of Science and Technology, India. Insights gained during discussions with distinguished invasion ecologists at NeoBiota 2018, 10th International Conference on Biological Invasions: New Directions in Invasion Biology, Dun Laoghaire, Ireland improved ideation in the manuscript.